I love a good story about women pushing the boundaries in times past, especially when they are based on real people. 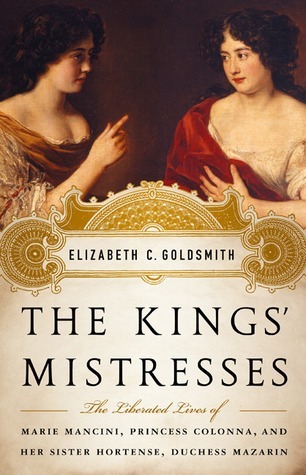 The Kings’ Mistresses is the true tale of two sisters: Marie Mancini and her younger sister Hortense, the nieces of one of the most powerful men in seventeenth century France, Cardinal Mazarin (a protégé of Richelieu.) Mazarin, rose from obscure roots in Rome to become Prime Minister to the Queen Regent of France, Anne of Austria and her son Louis XIV. Along the way he acquired great wealth as well as influence and enemies. He hoped to consolidate his influence by the well-known ploy of strategic marriage, so he summoned his Italian nieces and nephews to the French court. In 1653 Marie, “a dark-haired and intelligent-looking adolescent of thirteen” and Hortense, “a mere child of six, with curly black hair and striking in her delicate beauty” left their home in Rome to travel to Paris. It was the first of many journeys in their fascinating lives. The “Kings” of the title are Louis XIV of France and Charles II of England. The adolescent Marie enchanted the young Louis while he convalesced from a dangerous illness and they began a romantic relationship. Madame de Lafayette wrote of the affair, “Mazarin was not opposed to this passion as long as he thought it could only serve his own interests.” The Queen Regent was not amused. She arranged a more suitable marriage with a Spanish princess and Marie was banished from court. Her uncle arranged for her to marry a Roman noble. After providing her husband with several male heirs, he took a mistress. Friends started whispering to Marie, that her husband was unhappy and sought a more permanent solution than separation. Marie, fearing for her life, left Rome. Hortense captured the affections of Charles as a mature woman after escaping to the English court to avoid the legal machinations of her husband. But it was not the first time the beauty caught the King’s eye. He had approached Mazarin about a marriage to the fourteen-year-old Hortense while Charles was still in exile in France. The Cardinal thought she could do better than a deposed and exiled king and married her off to an older man who turned out to be jealous and unstable. The husband gave away, to the church and various individual clerics, the vast wealth Mazarin provided Hortense on her marriage and upon the cardinal’s death. He dismissed any servant that became close to her, locked up her personal jewels so she had no access to her own wealth and tried to keep her in strict seclusion. She fled, in secret, leaving her four children behind. Her husband, in a fit of rage, destroyed Mazarin’s art collection, one of the largest and most important in Europe. The sisters’ actions sparked discussion all across Europe on the rights and roles of women in marriage. Should a woman be compelled to stay with a man even when he threatened her life or squandered her children’s inheritance? The time was right for a more liberal outlook. The Enlightenment was in full swing and prominent writers and thinkers took up the cause, pro and con. Were the sisters early feminists exercising natural (if not legal) rights to life, liberty and the pursuit of happiness? Were they wonton libertines, searching only for their own pleasure; a disgrace to womankind? The truth probably lies somewhere in between and Goldsmith lets the readers decide for themselves. Goldsmith became interested in these two women while researching a historical study on French women writers. They were among the first women to openly publish their life stories and sign their own names. She had access to an enormous trove of letters from the sisters, their relatives and friends; carefully preserved by their descendants. Goldsmith uses a chronological approach to the biography mostly alternating chapters about the lives of the sisters as both women travel from place to place (but seldom together) escaping their pursuing husbands. I enjoyed this well-written and well-researched tale, but it left me wanting more. It’s a relatively short book (226 pages not counting notes and index), to cover two women’s lives. Given the material available to Goldsmith, I would have liked more excerpts from the sisters’ writing. Each chapter is started with a brief quote, but incorporating more in the text would have helped me hear their own voices. There is also room for more analysis on societal norms and customs of the times. Were laws changed? Expectations altered? Did other women follow in their footsteps? Given the theme of liberation, it would have been nice to see what influence the sisters had on other women and society in general. But what is provided is fascinating and well-told. Note: I received this book free through an Early Reader Program at LibraryThing.com. The opinions expressed in the review are my own.